It's not surprising that Bella replacement vinyl wrap kitchen cabinet doors and drawer fronts pass the FIRA Gold award test for excellence in furniture. Their products are made to the highest standard from 18mm MDF and vinyl wrapped in one continuous piece to give a high quality durable finish on both face and edges. With over 20 styles of door and 35 colour finish options, there’s a made to measure kitchen door combination to fit every kitchen design. 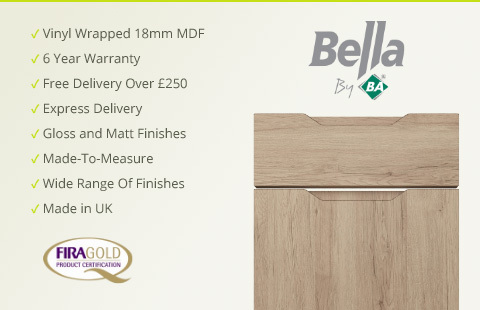 Just like our other kitchen cupboard doors, Bella kitchen doors and drawer fronts now come with a 6 year guarantee. For curved doors please see the Bella kitchen accessories section. Although we offer Bella doors and accessories as part of our complete kitchens, if you just want to give your kitchen a fresh new look on a budget, it may be worth considering a kitchen makeover. A makeover is ideal when your fitted kitchen units are still sound and in good condition, but you just want an updated look. There are a number of ways to carry out a kitchen makeover to achieve the look and feel of a brand new kitchen without replacing all the fittings. Purchasing new kitchen doors and made to measure drawer fronts and accessories is an excellent way to give a tired kitchen a face lift but with minimal mess and cost. The best part is that you can transform your entire kitchen from a tired room into a stylish and modern kitchen at a fraction of the price, literally saving thousands of pounds. There is no hassle either, with installation of made to measure kitchen doors and drawer fronts taking just a matter of a day or so. There is no need to even empty cupboards as the old kitchen units won’t be pulled out. Our complete collection of Bella Kitchen Doors at Lark and Larks is an ideal choice for your replacement kitchen doors. The range of vinyl kitchen doors is perfect for those who enjoy traditional styles and modern clean styles. With a wide array of made to measure kitchen doors in a variety of plain styles and muted tones, these doors are incredibly stylish and can be used to create a completely new look along with matching drawer fronts and accessories. The wide range of quality made doors come with a six year guarantee and include popular designs such as the plain matt finish of the Venice door and the ornate peaked arches of the Gothic door. With Bella replacement kitchen doors, you will be delighted by the quality and workmanship that gives your kitchen a fresh and rejuvenating feel. Rather than investing the considerable time and money in a completely new kitchen, you can enjoy the look and feel of a new kitchen in just days without the hassle and at less than half of the usual cost. Your kitchen doors make an important impression in the overall look and appeal of your home. Replacing these doors can help to not only tie the space together visually but also increase the resale value of your home. Bring a Room Together: Replacing all of your kitchen doors will create a consistent stylish and modern look will improving the visual flow and appeal of your home. Save Money on Home Improvement: Fitted kitchens will cost more due to changing all of the carcasses. Simply buying new kitchen doors will create the illusion of a brand new fitted kitchen without the burdensome cost. Save more by installing them yourself. Save Time & Energy: By purchasing kitchen doors online, it is easy to get them ordered, delivered, and fitted in less than two weeks. The installation is just a matter of days. Less Mess & Less Stress: Choosing to replace only your kitchen doors will save money and time. If you are considering just simply removing the old doors and fitting new ones, you don’t need to worry about all of the dust and debris commonly associated with major renovations. An Environmentally Friendly Choice: Choosing new kitchen doors is the ultimate reduce and reuse project. These quality kitchen doors are manufactured to the highest standards with a durable finish made of vinyl that is wrapped around the face and edges of the door. Each door is manufactured with care for the environment in mind using only high-rated medium-density fibreboard with material that has been sourced in sustainable forests. The range of made to measure kitchen doors and drawer fronts allows homeowners to create a completely customised fitted kitchen using the extensive collection of vinyl kitchen doors and matching accessories for a fully coordinated look suited to your personal style and tastes. All of the kitchen doors and matching vinyl accessories made by Bella can be made to measure for the exact specifications that are required. Whether you are looking for a modern, classic, or traditional style of kitchen, Bella’s impressive range of colours are carefully designed to provide you with the exact look and feel that you desire. You can select from 16 wood grain patterns, 12 solid colours, and 9 high gloss colours. From traditional choices like Canadian Maple to contemporary selections like Matt Stone Grey, the extensive colour range is sure to have a choice to suit you. Ivory is a popular choice for those adopting the white kitchen trend. If you would like the option to paint your own cupboards and repaint in the future as necessary, the collection also has a paintable vinyl option that you can use to customise your kitchen whenever you like. All of the unique 24 styles can be made to measure or are also available in standard sizes. Each style is available for use not only in the kitchen but also in the bedroom or bathroom as well. The collection features a range of contemporary, traditional, and gloss designs. Each design represents simplicity with sleek and elegant lines. Your kitchen doors can be complemented by a wide range of matching vinyl-wrapped accessories to create the perfect look including drawer fronts, worktops, handles, and other finishing touches like plinth and cornice. There are a wide array of choices to suit your home and lifestyle including Tuscany, Newport, Lincoln, Gothic, and Roma among several other choices. Bella’s extensive range of 30 colour options and 24 designs can also be tailored for awkward spaces and roof slants where doors will be made to measure to suit the needs of your home. Your kitchen is an important living and working area in your home. It should be tailored to reflect your preferences as it represents your personality. The Bella range can provide you with a complete new fitted kitchen or you can simply give your tired kitchen a fresh lease of life by replacing certain components. It doesn’t need to be an expensive or tiring exercise. Simply contact Lark and Larks for a free no-obligation design and quotation and we can take care of the rest for you. These kitchen cabinet doors and drawer fronts are available in both standard and custom sizes as well as with glass effect frames and inserts. See the Bella accessories section for matching curved carcasses and curved kitchen doors, plinth, cornice, end panels and more.